Look forward to popular Punjab dishes such as Sarson da Saag (vegetarian curry made of mustard greens and spice) and Makki di Roti (flat, unleavened bread made from corn flour). These are served alongside dishes made using secret recipes from royal kitchens. Romantic Dining redefined at Punjab Grill by the Specially Curated PUNJABI SUTRA MENU at SGD 219++/ Couple by Chef Javed Ahamad & Team. 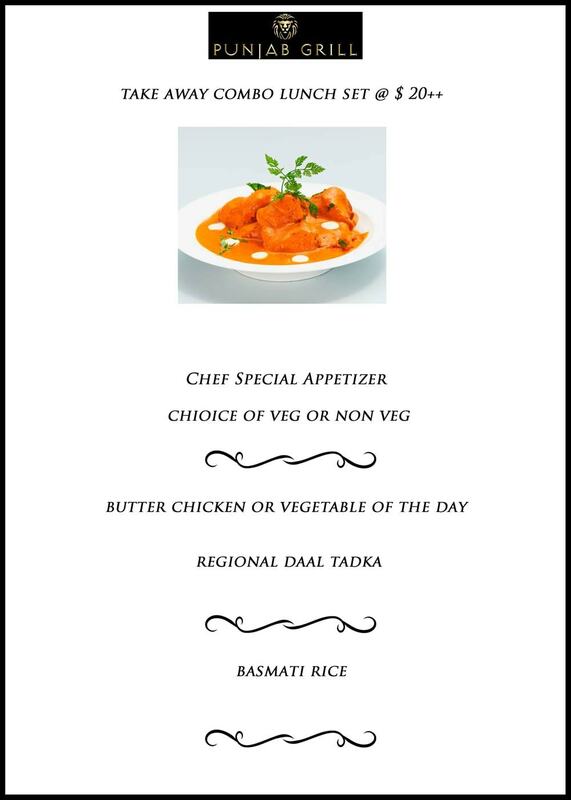 Choose from a Vegetarian or Non-Vegetarian three-course power lunch set. Each comes with your choice of drink. Take an epicurean journey through India’s gourmet metropolises at Punjab Grill. Mains include Butter Chicken. Feast on an unlimited spread of succulent kebabs and aromatic biryani. Round off the meal with a delectable selection of desserts. Vegetarian options are available. Ahamad has more than 11 years of experience creating unique Indian dishes for the Singaporean palate. He was the first to introduce an Indian-style champagne brunch in Singapore.